What the hell, Ayutthaya. Seriously. Three hundred years ago you were the largest city in the whole world. The WHOLE world. A million people called you home. Empires vied for valuable trading positions. Other empires viewed you jealously. You were essentially the Brangelina of the early industrial revolution. And yet somehow my history lessons seem to have skipped over you, in favour of other more exciting adventures like the peasant revolution in Russia, circa 1917. Or all that stuff with the Vikings. This could be something to do with those rascally Burmese, who back in 1767 rocked up and rather unfortunately razed you to the ground, ending a period where you were both the capital of Siam, and arguably the trading capital of the world. The glory of Ayutthaya faded, and you were replaced by Bangkok, an upstart city to the south which had previously just acted as a port. Nowadays, all you have left to show for your historical significance are a series of ruined temples and other important stone built buildings in varying conditions. The majority of the city having been made of wood wasn’t the long term survival plan you may have thought. River barges still plough your waterways, although their cargos are more likely to be camera happy visitors than exotic spices or royal personas. Still, you’re more than worth a visit. Those temple ruins are some of the most magnificent in Thailand, despite repeated attempts by nature (earthquakes and flooding) and man (looting, ignorance) to take their toll. This was recognised by you being awarded UNESCO world heritage status in 1991. So what do you offer today’s visitor, keen to relive your glory days of yore with an exploration of your crumbling ruins? Let’s take a look. And also, I’m going to stop talking to the city now. 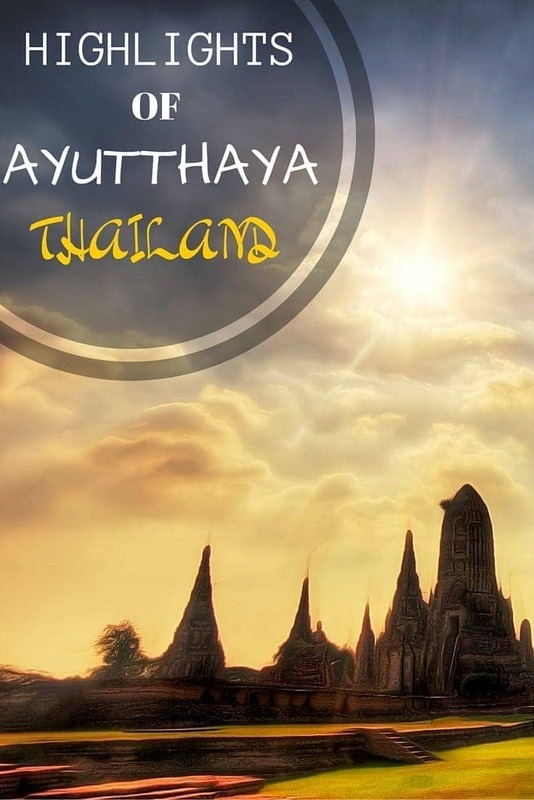 And address you instead, dear reader, and share with you my guide to what to do in Ayutthaya. Let’s go! 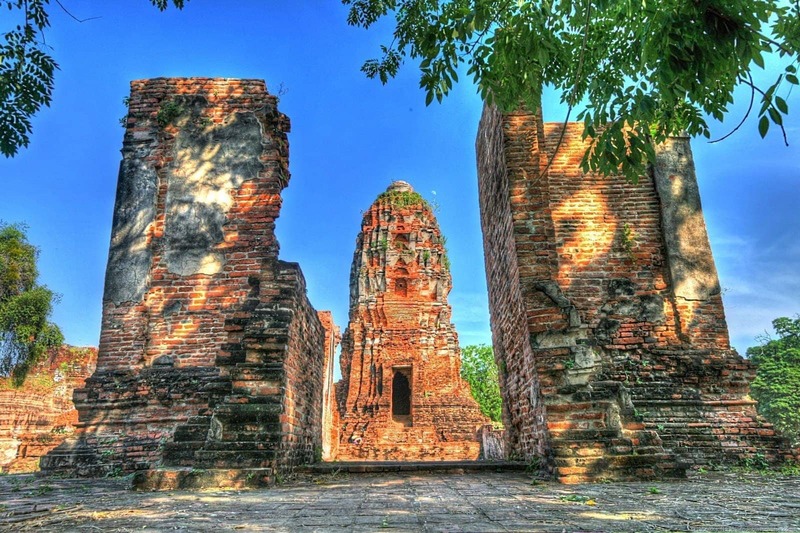 I know, I know, Ayutthaya has all these crumbly epic ruins to see and I’m suggesting a visit to the Tourist Office. But there’s a good reason for that. First, you can pick up a free map of the city. Free is good, plus it lists all the highlights. Second, and more importantly, the tourist office building also hosts an excellent exhibition on Ayuttayah, detailing the rise and fall of the city, as well as an overview on the food, the people, and the sights. A good place to get your bearings before setting off for the temples proper, and learning all of those facts that your history lessons may have glossed over. The largest temple in Ayutthaya, this is one that you absolutely cannot miss. 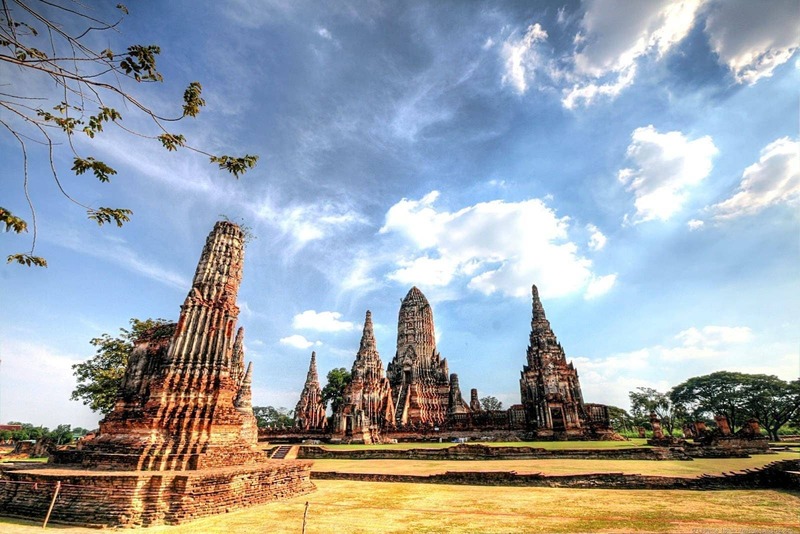 The main draw are the three enormous chedis in a row, which you will see featured as the symbol of Ayutthaya all over the place. They really are quite large, and rather photogenic. Fun fact – this used to be the home of a giant buddha covered in a third of a tonne of gold. The Burmese invaders found this to be just too tempting, and melted it down as part of their pillaging. 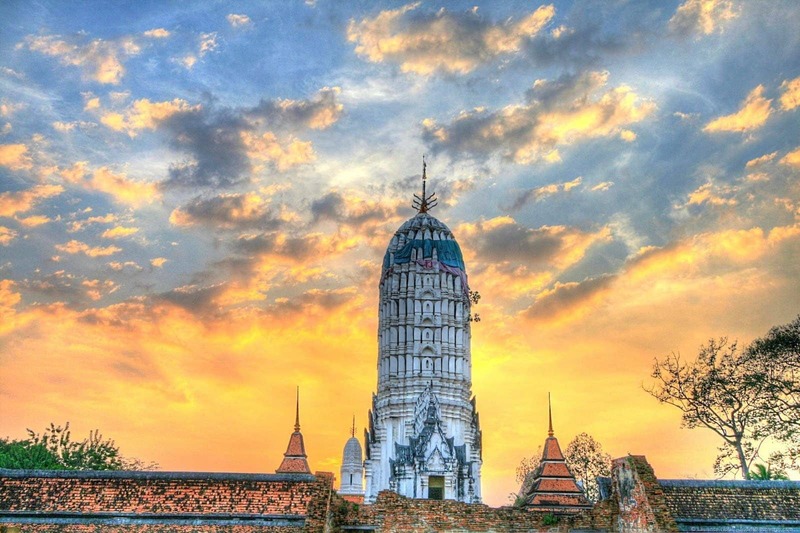 This is one of most photogenic Wat’s in Ayutthaya, featuring a large central chedi surrounded by pagodas. Normally you can climb to the top for a lovely view of the city, and it’s also a good place to watch the sunset from. I say normally because when we visited flood damage has resulted in it being closed. The bad news meant that we couldn’t climb anything, the good news was neither could anyone else, so the pictures were happily people free. And lack of access also meant the entry fee was waived. So it wasn’t all bad news. Home to a wonderful reclining buddha (as seen in the first photo in this article), this temple on the banks of the Chao Phraya is still in use, unlike all the others on the list. Being in use means access is free of charge. There’s a lovely courtyard with a huge prang, hundreds of intact Buddha statues, and even some ruined bits out the back. It’s a good place to visit to get an idea of what the other temples might have looked like, had the Burmese not done their thing. The majority of the temples in Ayutthaya have an entry fee, which is paid at the temple entrance. The exception to this rule is active temples, like Wat Buddhaisawan, which doesn’t have an entry fee. This pass can be bought at the entrance to these temples, and is worth purchasing if you plan on visiting at least five of these temples. If you’re only going to visit four or less, buying individual tickets will be a better idea. Our preferred method for exploring Ayutthaya was on foot, although since no-one else in Thailand appears to travel by foot, we are usually the odd ones out. The distances aren’t too great for getting between the sights by foot, although if you want to speed things up a bit, and visit more temples per day than we managed, then a bicycle is going to be the best option. These are easily rentable, and the tourist map that you can pick up comes with a suggested touring route. Other options for getting around include tuk tuks, and covered pick up trucks known as songthaews. The latter are a bit like buses in that they will usually have a fixed price and ply a set route, the challenge is working out if that route works for you. The former will usually take you where you want to go – just make sure you agree on a price beforehand. Finally – don’t forget that there are countless places to cross the river by ferry. These are local services, so will be both inexpensive and not obviously signposted. Just ask a local for advice if you get stuck – they’ll probably be more than happy to help out. Many people visit Ayutthaya as a day trip from Bangkok, with a temple run for the day, and maybe a river cruise in the evening. We’d suggest if you do this, the easiest way is going to be just to book a tour like this one, which includes return transport, lunch, all your admission fees and a guide. It is of course totally possible to do it on your own as well, taking a bus or train from Bangkok and then either walking around the city, or using a bicycle or tuk-tuks to get between the sights. You are going to be packing a lot in though, and might find yourself fairly exhausted by the end. If you’re travelling independently, I’d definitely recommend staying at least one night in Ayutthaya, and maybe even two. Buck the trend… go on! There are a lot of temples to see, and each ruin complex can take a couple of hours to fully explore. Factoring in food stops, pauses to escape the ever present heat, and the sheer volume of sights on offer, and two or three full days will let you explore in a more leisurely fashion. We were there for four full nights, and didn’t regret this decision at all. 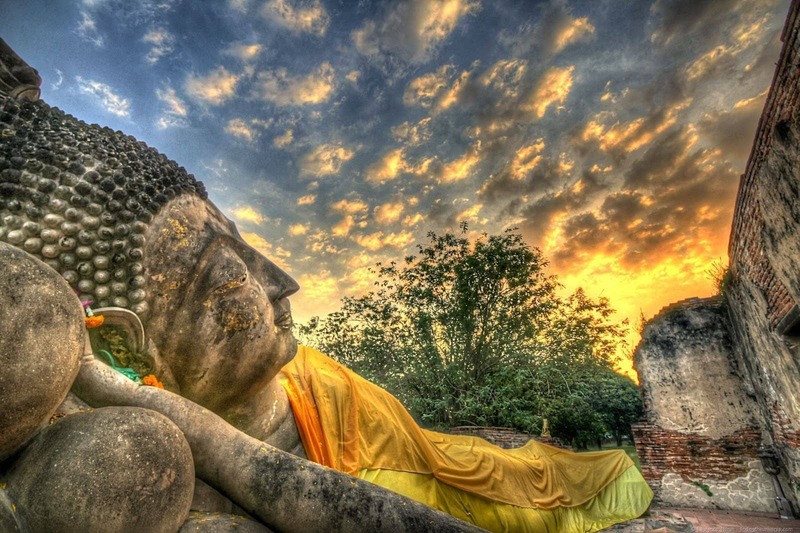 If you do decide to stay overnight in Ayutthaya (good choice! ), there’s no shortage of accommodation options to choose from. Our suggestion would be to check out the accommodation options on booking.com, where you’ll find a wide range of choices for the city. For example, here is a well rated and centrally located hostel, and here is a mid-range and very highly reviewed option. You definitely won’t struggle to find fantastic properties to stay in, whatever your budget! To be totally honest with you, Ayutthaya is basically going to be hot and humid all year round. The best time to visit, as with much of this area of Thailand, is going to be between November and January, where it might be a little bit cooler. This is a very relative use of the term cooler, though – temperatures are still going to be in the thirties and humidity is going to be high. Whenever you visit, make sure to keep hydrated and try to avoid prolonged exposure to the sun. It’s hot out there! Train travel in Thailand is generally slower than road transport, but the scenery is nice and cruising along with the windows open taking in the view can’t be beaten. From Bangkok, trains depart several times a day from Bangkok’s Hualamphong station, prices ranging from 30 – 250 baht depending on class. Rail timetables are available in English from the Thai railway website: railway.co.th. The train station in Ayutthaya is located to the east of the city island – to get to the centre from the train station you’ll want to cross the river using the local ferry, which costs around 4 baht. Bus is the fastest public transport option to Ayutthaya, with departures every 20 minutes or so from Bangkok’s northern bus terminal (Moh Chit). Buses also come to Ayutthaya from a whole number of other Thai cities, although timetable information is hard to find online. Ask at the local bus station if in doubt. From Bangkok it takes around 1.5 – 2 hours to get to Ayutthaya, depending on traffic, and costs 50-100 baht. 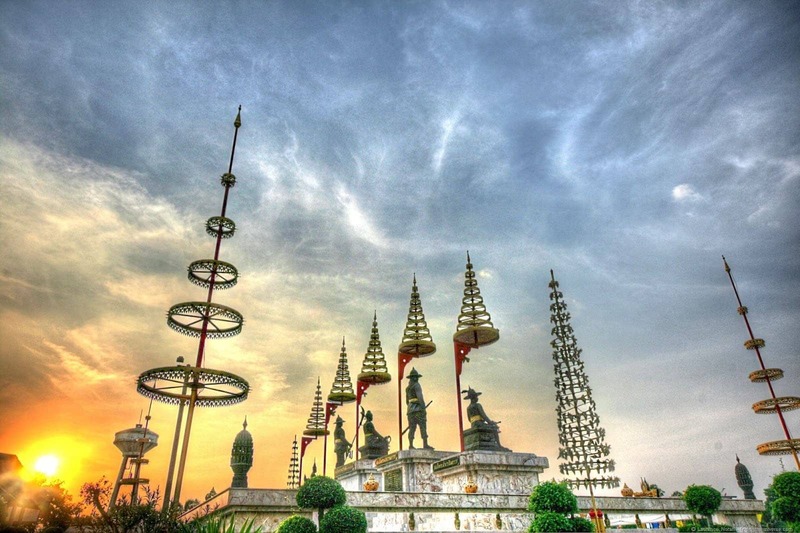 Minivans and tours also operate from popular tourist spots in Bangkok, price varies. If you’re feeling like a river cruise, then you can take a boat cruise from Bangkok up to Ayutthaya (or vice versa, most day trips offer boat in one direction and bus in the other). These aren’t scheduled services though, so you’ll need to book a tour in advance, and be prepared to spend at least a day on the river. It’s a beautiful way to travel though, so if you’re not pressed for time (or cash! ), then this could be the way for you. If you want to visit Ayutthaya as part of a tour, you have a number of options, including river boat tours from Bangkok, and day trips that include the city. Here are a few options to consider. A full day tour to Ayutthaya by bus, with lunch included. There’s no river tour, but that gives you more time to see temples. 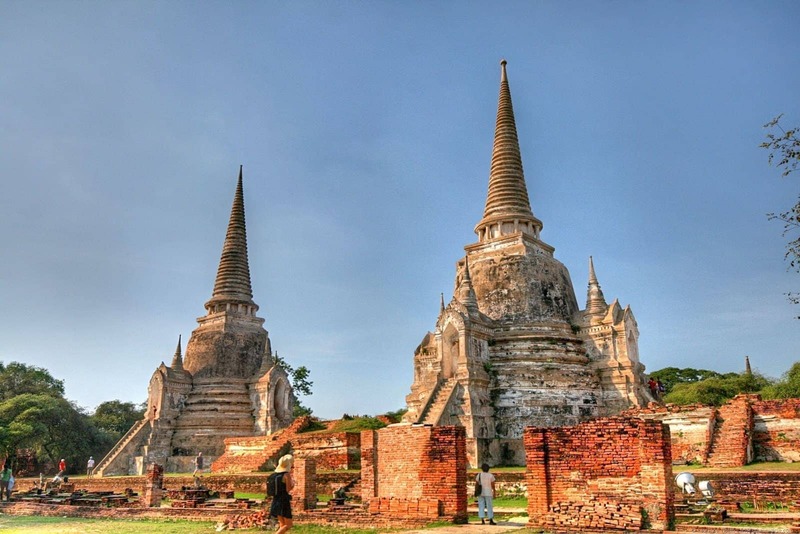 A private full day tour to Ayutthaya by bus. A full day tour from Bangkok to both Ayutthaya and Khao Yai National Park. See our guide to visiting Khao Yai – it’s a lovely national park well worth the visit! As always, we recommend reading the reviews and looking at a few different tour options to find the right one for you. If you’re looking for more information to help plan out your Ayutthaya trip, then I can recommend the regularly updated crowd sourced wikitravel entry on Ayutthaya, which will have more up to date information on travel options and pricing. Alternatively, the Tourism Authority of Thailand can usually help out with information on planning and information on booking. Finally, if you’re looking for something a bit more physical, then Amazon have a selection of books on Thailand, including the ever popular travellers bible to Thailand. And that about wraps up my tips for a visit to Ayutthaya! Have you visited this ancient city, or were you, like me, oblivious to its existence? As always, let me know in the comments below! I loved visiting Ayutthaya. Will definitely make it back to see some more of the city. Excellent choice for temple seekers and history buffs. Lovely post! We have been to Ayutthaya twice so far and we love the place. Regarding the river cruise from Bangkok to Ayutthaya… do you have any contacts of a cruise company that I can check with? Thanks very much 🙂 I don’t have any direct contacts, but your comment inspired me to add a section to the post on various tours, which includes some boat options. Looking at the tours on offer, most of the day trips from Bangkok offer the boat cruise in one direction only, with a bus in the other direction, presumably to save time. If you were looking to go one way and stay overnight, I think you’d have to look at another option – I couldn’t find anything but I’m sure they’re out there! I recently travelled for the 5th time in Thailand and finally went to Ayutthaya… I did it on a budget and spent under $30 to see entire Ayutthaya… Ayutthaya is a must visit place for anyone traveling to Thailand. Btw Greetings from India and I am also a Travel Blogger – If you plan to visit India let me know would love to show my city and country. Hi lovely couple! 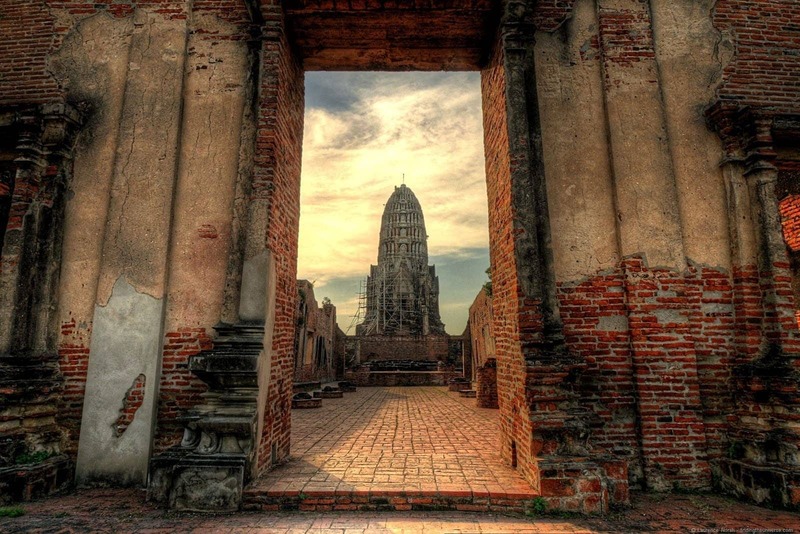 We will also be visiting ayutthaya next month, are there entrance fees in each temple? Thanks! Have a great trip, let us know how it goes! Hi Laurence and Jessica! 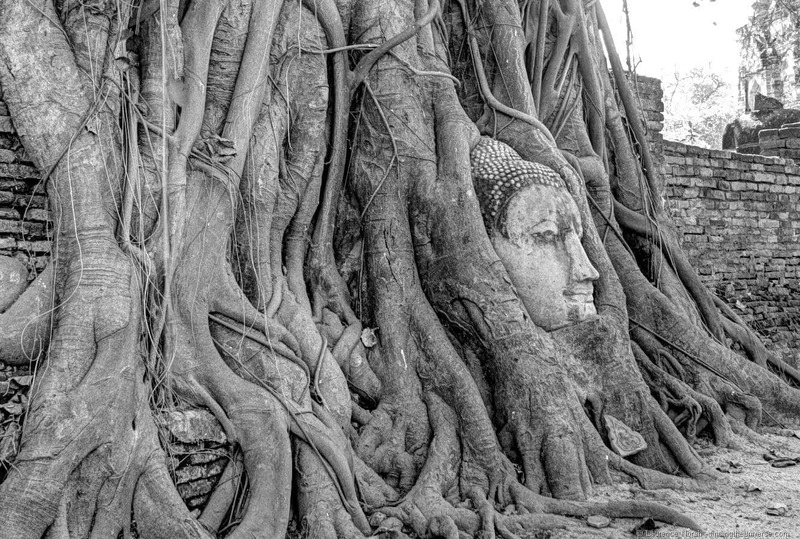 Do we need to book a tour just to go to Ayutthaya or is it okay if we just go there and explore? 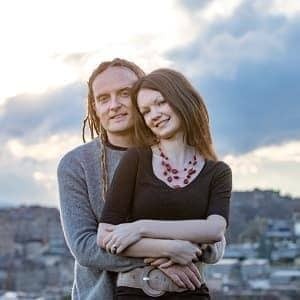 Hello Laurence and Jessica, you recommend us to visit the Ayutthaya’s Tourist Information Office, the thing is, it seems there is more than one in Ayutthaya (https://www.google.cz/maps/search/Ayutthaya+Tourist+Information+Office). Which one is the right one with an exhibition? Thank you very much!